Group signs agreement in principal with Port of Portland for 45-acre site along Northwest Front Avenue. A 45-acre former cargo terminal on Northwest Front Street near the Willamette River could become the site of a ballpark capable of luring a Major League Baseball team to Portland. The Portland Diamond Project, a group that formed in 2017 with the mission of bringing an MLB team to the city, announced it has signed an agreement in principle with the Port of Portland to develop the 45-acre Terminal 2 site. 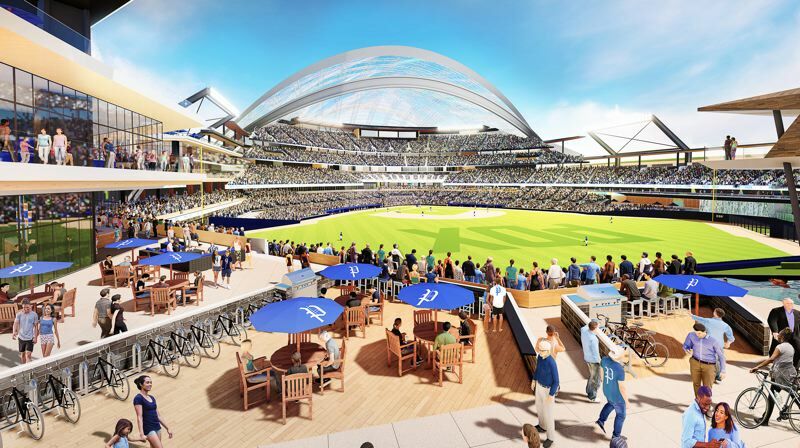 In a statement, Craig Cheek, PDP founder and president, said placing an "iconic, state-of-the-art ballpark" at the site will "catalyze economic development." In a letter of intent, Cheek stressed that his group's intent is to build "a sustainable, equitable and accessible" ballpark that will provide opportunities for Portland-based businesses. "That means outstanding locally sourced food and beverage amenities, environmentally sustainable construction and operations, (and) opportunities for markers and small businesses …" Cheek said in his statement. "Although additional options continue to present themselves, we are excited to announce that Terminal 2 is our preferred location …" he added. 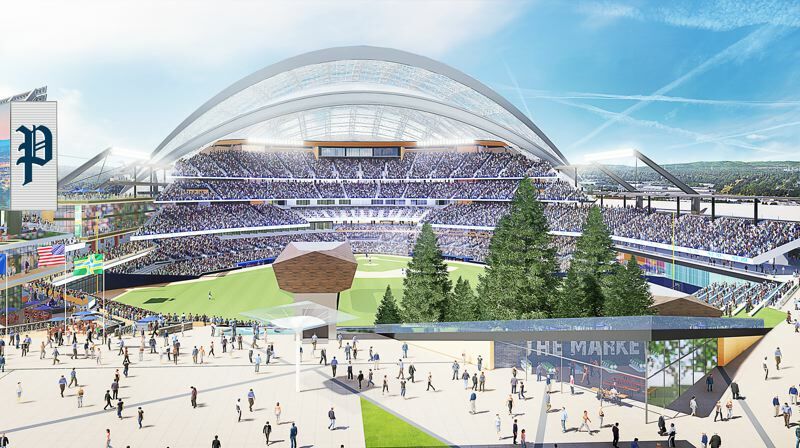 Renderings released by PDP show a stadium structure with a retractable roof and a "bike tailgating" area. South Waterfront property that the Zidell family had at one time planned to turned into a major mixed-used development called Zidell Yards. PDP offered PPS $80 million to purchase the Blanchard site, but withdrew the offer in early November. Leaders of PDP said they decided the property was a better fit with a plan that a group called Albina Vision Trust has to redevelop that area, including building affordable housing and creating opportunities for diversity and inclusion. PDP also told a local news outlet during the summer that at least one location outside of Portland city limits had been considered. That location was never publicly identified. The Portland Diamond Project is the most recent chapter in a city baseball history that can be traced back to 1866 when the Portland Baseball Club formed. The city hasn't seen any level of league baseball activity since 2010, when the Portland Beavers, a AAA team, left the city to make room for the arrival of Major League Soccer at what is now known as Providence Park in the Goose Hollow neighborhood. Earlier this year, PDP announced that Russell Wilson, a quarterback with the Seattle Seahawks football team, and his wife, Ciara, had joined the organization as investors and co-owners. This past July, MLB Commissioner Rob Manford said the organization would like to eventually increase to 32 teams. Portland was among the group of possible new team locations, along with Nashville; Charlotte, North Carolina; Las Vegas; Montreal; and Mexico. Gresham resident Lynn Lashbrook, who has been pushing to bring a major league baseball team to Portland since the late 1990s and was part of the campaign group that pushed forward HB3606, sparked some local interest last year when he suggested a stadium could be built using cross-laminated timber. The material, which is made by gluing pieces of wood together at 90-degree angle and then subjecting it to high pressure, is touted for being both light and strong. The state of Oregon made headlines earlier this year when it adjusted building codes to allow CLT and other mass-timber buildings to be built higher than the previous height limit of six stories. While the material has been used in several projects in Portland, including LEVER Architecture's Albina Yards office building and Kaiser Group's mixed-use Carbon 12 mixed-use project, it has not yet been used for a stadium in the U.S.